Our Signomat S2, Signomat S2 electrolytic marking are used for marking of metal items of different shapes and sizes with letters and numbers, graphics, trade marks, scales, data or logos. This is used in wide range of applications for trade and industry. Signomat S2 is suitable for the smallest series. It can be expandable to full automation due to its construction system and are versatile, sturdy and durable. All devices are certified concerning DIN GS for approved safety and are labeled with the "GS-symbol". End of marking time is indicated by an optical and acoustic signal. 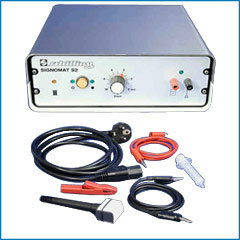 We are sole suppliers and distributors of German make schilling marking machines, electrolytic marking machines. Owing to the experience of our team and ethical business practice we have carved a niche for ourselves in the market.